Post edited (12/10/12). See below! Commenter szopeno once noted that if you ask women what their ideal family size is, you will get an average of about 2.1-2.5 children (trending towards the low side in Western world). As previously discussed here, the decline in fertility among Whites in America is primarily among liberals, with White conservatives still breeding quite well. A variety of potential explanations have been put forward for why this is so. For one, a general decline in birth rates seems to be related to the difficulty in attaining the means to comfortably raise a family. In addition, some of the key qualities that differ between the two ideological groups include the fact that liberals tend to get married later (or not at all), and that conservatives tend to live in more sparsely populated areas of the country (and population density appears to severely impact fertility). However, perhaps more significant is the notion that liberals simply want to have fewer children than do conservatives. That is, conservatives may be more “pro-natalist” than liberals. Jason Malloy hypothesized people have weak desires for children for their own sake, and that changing standards of living are responsible for the drop in fertility; this suggests that “natality” is typically low. I have disagreed with this point, at least as far as that the desire for children is typically weak—indeed, as Half Sigma has noted, people (especially women) tend to obsess over children. Indeed, my own pioneer hypothesis posits that people’s desire for children, for their own sake, varies according to political/ideological belief. At the heart of the issue is whether people are having fewer children because they actually want fewer children. Has that changed over time? 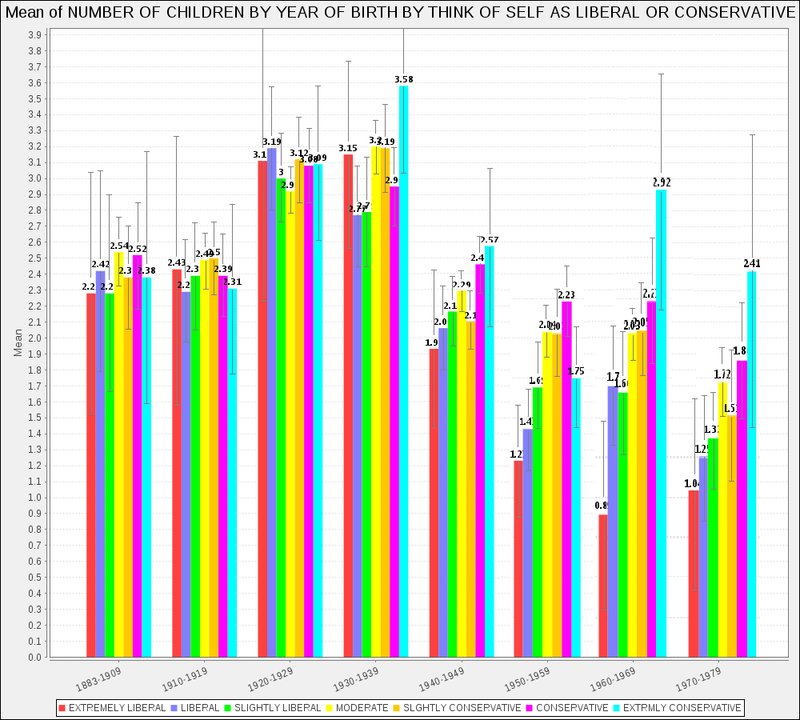 Do conservatives want more children than do liberals? I decided to find out. The Inductivist and the Audacious Epigone have both tackled this issue before, but I wanted to do an in-depth analysis of the data from the GSS. As seen previously with fertility data, the distribution of desired family is pretty even in the earliest cohort, but starts to slant more heavily towards conservatives in successive generations. 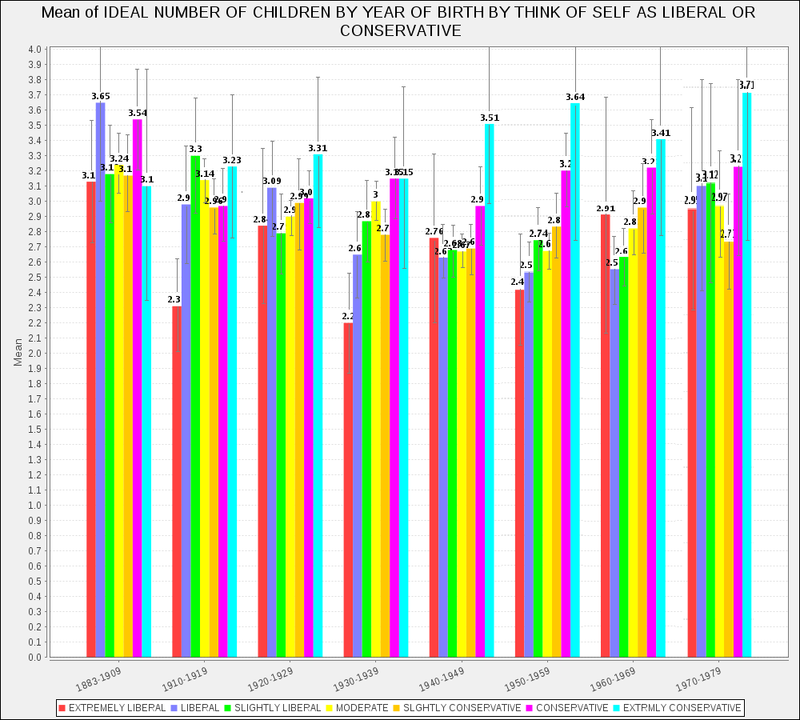 But note that in all cohorts for all political orientations, the desired number of children is always over replacement, even for “extreme liberals”, who we know are today poorly fecund. Here, the rise and fall in fertility rates during and after the post-War Baby Boom and the “demographic transition” that followed is evident (presumably, I just miss the tail end of the high-fertility pre-Depression era generation trough here). Indeed, most cohorts reliably under-perform their expectations, except the Boom cohorts, who exceeded their wishes with family size. A funny fact that is evident here is that it seems that conservative women didn’t quite get the memo that they were supposed to “transition” demographically, and maintain fertility rates comparable to their pre-Boom levels. It is everyone else—especially liberals, who have greatly changed their behavior with regards to having children. It’s quite likely that the gap between desired children and number of children actually is somewhat different in nature today from times past. As we’ve seen, back in the day, there were proportionally more people who had a lot of children as well as more people who had none (particularly so with women); the spread in children was more uneven, with some people breeding a lot, and others not at all. Today, things are more leveled out, with most people having a small number (1-3) of children. We see here that in most cohorts, each group falls shorts of its desired family size by an average of a half to a whole child. The notable exception are the Boom cohorts, who generally exceeded their planned number of children. However, after the Boom years, liberals begin to significantly miss their goals for family size. This is on top of a preference for smaller families. Conservatives on the other hand generally don’t fall anomalously short of their expectations, and even then, the impact is blunted because their desired number of children is so high. If anything, their desired family size appears to have only increased, especially for those on the far Right. However, these data show that the liberal failure to reproduce isn’t due, by and large, to a lack of desire for children, since liberals do want typically reasonably sized families. However, the loss stems primarily from delayed marriage/family formation, particularly due to the pursuit of lengthy educations, as my earlier research showed. I’ve heard it said that women pursuing lengthy educations, assuming that can just begin to have families later in life (late 20s and 30s), fail to realize how much their fertility falls with time (with 90% of a woman’s egg cells typically already gone by age 30, [edit:] original paper here, opens pdf). As extreme K-competitors, generally with ancestral origins from behind the Hajnal line, liberals especially appear to have been selected to seek economic viability before procreating. In today’s environment, with its stagnant wages that compare poorly to expenses, economic viability is increasingly more difficult to attain. Genotypically, White Americans are getting more conservative, and the future will come to be dominated them (and the non-White groups in the country). While this shift towards the Right among Whites is likely to be slow, it appears, at least for now, to be inevitable. Edit, 12/10/12: There is a paper by Marcus Jokela that shows fertility can also be correlated, as I have done here, with personality on the Big Five scale. It finds that, among both sexes, the Big Five dimension of openness to experience, the hallmark of liberal-minded people, is strongly negatively correlated with fertility. Among women, conscientiousness is also strongly negatively associated with fertility. This is probably because these are the women are most likely to pursue lengthy educations and most likely to feel the sting of resource insecurity. See also Religion, personality and fertility | Evolving Economics, Epiphenom: Why are religious people so fertile?, and The Audacious Epigone: Providing procreation predictors, pronto. One of the themes of (I guess I’ll call it the Dark Enlightenment) is that liberals are very hypocritical. That is they say one thing but do another. Should we be surprised that they fall short on doing what they say? There is a difference between saying you want something and then actually going out and getting it. When it comes down to having a family you have to make choices sometimes. Liberal women don’t want to make those choices. It’s not just that they live in crowded areas (they choose to live there, often moving there) or that they spend a lot of time in school (they choose to get educations, even when they have other options). Conservative women simply make different choices because they know they can’t “have it all.” And when push comes to shove they choose children. They desire it enough to give up other things. Liberals may desire children, but obviously not enough. Conservatives may have more kids, but Conservative parents doesn’t equal Conservative kids. Far from it. Liberals are made, not just born. You may have a Right-wing mommy and daddy, but every single other educational influence in your life from Pre-K through PhD will be hard-core Liberal. Every cultural influence in your life will be Liberal. It will take an enormous counter-insurgency from the parents to counteract the dominant Progressive world out there. And it requires a great deal of personal integrity and strength to avoid just going along with the crowd. This is why I think Liberal kids of Conservative parents are far more common than Conservative kids of Liberal parents. The Progressive Sausage Machine churns on, and until that gets changed I don’t see a significant drop in the number of white Liberals. I am a staunchly conservative daughter of very liberal parents. I am a math major at a top-5 school. I am aware of and accept the fact that the mass media and popular culture don’t often represent my own views and that is ok. I just think of politics as a show that I sit back and watch over my lifetime, as long as its policies don’t harm me too much personally. But deep down I have always known the path I want to follow (I have very strong personal opinions that I won’t compromise on, and I always trust myself, my judgement, facts and experiences before I trust authorities-my mom remembers that as a barely 1-year-old, I was dubious when she told me not to touch a prized china cup because a monster would jump out and grab me). I want to have at least 3 kids-I hate how liberals make everything out to be binaries, to be either or: they seem to love making up conflicts to invoke war and division. Someone with very strong personal opinions who is not able to compromise, distrusts others, and makes broad, ignorant statements about a hundred million people with whom she disagrees may or may not be a conservative, but she certainly sounds like someone who has trouble making friends. Peterike – political orientation appears to be about 80% heritable. I think liberal children of conservative parents are much more visible because they’re more likely to whine about how awful their parents were, while conservative children of liberal parents tend to get along better with their parents. Indeed. However, according to the data I’ve seen, the heritability of political attitudes is more like 60%. I’ve seen it said that the heritability of non-cognitive psychological traits is higher, but so far I’ve seen no evidence that that is the case. Yes, they are confidence intervals. 10 – Young liberals’ belief that they have a human right to pursue a field that is not economically viable means of course that they will not be able to, you know, support anybody. Oh, gosh and I forgot the most obvious ones of all! 11 – Male homosexuality as the holiest and most righteous form of goodness that there is. 12 – Lesbianism as the other holiest and most righteous form of goodness that there is. All twelve of the above anti-natalist aspects are the very central pillars of the modern Democratic party. I put ‘liberal’ theology in quotes because what is today regarded as liberalism has almost nothing to do with real, classical liberalism. Reading this blog really gives an awful impression of conservatives. While many people posting anonymously on the Internet seem to be pretty ignorant, at least liberals aren’t hypocritically “Christian” on top of all of it. If you want to live a life of rage against people you know nothing about, consider the KKK, not the GOP. JP, I follow this blog, and I’m a liberal. (As is JayMan himself.) Some of the readers are undoubtedly conservative, others liberal–not much different than, say, any other corner of the internet. Personally, I wouldn’t equate anyone here too much with mainstream ‘conservative’ or ‘liberal’ thought. Since you’re responding directly to Dan’s post about liberal “theology”, do you have a specific objection to his claims? On most social issues, liberals and conservatives do divide between norms or policies which would create more children or fewer children. I don’t have to be anti-abortion (or pro-abortion) to recognize that more abortion = fewer children, less abortion = more children, for example. Different norms and values about childbearing and things related to family formation will of course show up as different #s of children. Whether that’s good, bad, or neutral is a matter of personal opinions. In response to JP, do respond specifically to points that I made, and then we can exchange like grown-ups rather than revert to name calling. I grew up in one of the most liberal parts of America (Montgomery County, MD), got an Ivy League education, and am back in the D.C. area. I have never met anyone in the KKK (or knew anyone who knew anyone in the KKK) and I know few bible-belt Christians. I am not even conventionally Christian although I do not recoil from Christians or fear them as you seem to. Your post indicates to me nothing so much as a liberal bubble. This is why I believe liberalism (modern, not classical) has much in common with religious belief. I said nothing theological, did not quote the bible, did not invoke any deity and you already recoil, fearing you might see something which might expose your lovingly constructed mindset to heretical thoughts. Boo! this is cool but you got to figure out a better way to present data than bar charts! You’ve noticed a significant problem with the author’s logic. The question asked of people was not “how many children do you intend to have.” It was “what do you think is the ideal number of children for a family to have?” The latter term is a hypothetical; it is not asking about expectation at all. A respondent might say the ideal income for a family is at least, say, 200k. That’s all well and good, but that’s not the same as saying they expect to earn 200k for their family. Women who feel they cannot personally afford to have more kids and who those who do not want to have a family seem to be the pretty clear reason for the gap. They may think the ideal is around 3, but if they can only afford one, or they don’t want a family for themselves, well, there’s your gap. Further, women like that may tend to be liberal for some of the reasons cited, but probably more important is the same factor that drives the preponderance of people with advanced degrees to vote Democratic. When one party is simply very loudly ideologically opposed to what an individual perceives as their interest – be that birth control or science or burning fossil fuels or singing country music of any one of a long list of ludicrously polarized issues – that individual may tend to align themselves with the prevailing alternative paradigm. I just don’t see any expectation/reality gap. Not really. Conservatives are poorer, on average, than liberals, but conservatives have more children. Globally, the strong correlation between poverty and fertility could hardly be starker, with fertility extremely high in poor countries like Nigeria, and extremely low in wealthy countries like Japan. Of course there’s that tricky “feeling” business. A person in the US with a moderate income might “feel” like they can’t afford kids even though they’re a thousand times wealthier than folks in Nigeria with 7 kids, because of some cultural or environmental factor, but even within the US,among people sharing fairly similar cultures and environments, we still see poor conservatives more willing to have children than wealthier liberals. As for liberals not wanting children, that seems obvious enough. (The big question there is why. I don’t think it is simply, as you seem to be saying, that people who happen not to want children call themselves liberals because it’s the liberals who happen to favor condoms and birth control (at the very least you’ve got yourself a chicken-and-egg issue there.) I think it goes far deeper than that, into people’s thoughts and relationships with the world. To oversimplify a lot of neuroscience I’ve been reading, most people seem to have various feedback mechanisms in their brains which help them socialize and learn from others–basically they’re rewarded, mentally, for doing what other people are doing. Evolutionarily, this is a sound way to not eat poisonous berries. People with really strong feedback systems will tend to want strongly to do whatever everyone else in their society does–that is, they will tend to have conservative natures. People with weak feedback systems, like me, are Aspie. A related set of feedback runs through the parts of our brains which process disgust. I personally feel so little disgust, I was shocked to find out that it’s a real phenomenon for others. I’d always figured they were making it up. Anyway, people with large regions of their brains devoted to disgust process more of reality through their disgust filters and so, simply feel more disgust about stuff. These people are neo-phobic and tend to be conservative. People processing reality through other parts of their brain will feel less disgust and thus be open to more things. “Openness” and “liberality” are extremely correlated. The gap is real, but easily enough explained by common phenomena, such as people not wanting to say they have too many kids. As an atheist, feminist, socialist, childfree, unwed professional with a high-paying career in IT (which is totally unrelated to my unprofitable arts degree — IN ENVIRONMENTAL STUDIES!!! — which I paid for using student loans! ), I’d have to disagree with Dan: although my partner of twelve years and I may not be having any kids, my gay friends all are. So don’t worry! Liberalism will live on. I’ve known plenty of gay folks who’ve *tried* to have kids, but few who actually managed to have them. Aside from the obvious technical inconveniences, I wonder if there might be some fertility issues. Either way, these folks aren’t about to beat my Mormon neighbors. Hi Zoe, welcome to the blog. We’re talking about genetics here. If liberal gay parents adopt and raise a child sired by (probably conservative) unrelated DNA donors, the DNA predisposing towards liberalism isn’t “living on”, it’s dying off. t finds that, among both sexes, the Big Five dimension of openness to experience, the hallmark of liberal-minded people, is strongly negatively correlated with fertility.